Sometimes jingles really stay with you. Sit back and close your eyes (well, maybe read this first and then close your eyes). Think about jingles… which one pops into your head first? “Mom and dad, mom and dad. Best darn parents a kid ever had”. I sing this in my head all the time. And my parents never even got me a Super Nintendo let alone Mario Paint. But still, it stuck with me. It took quite a while to find this commercial. 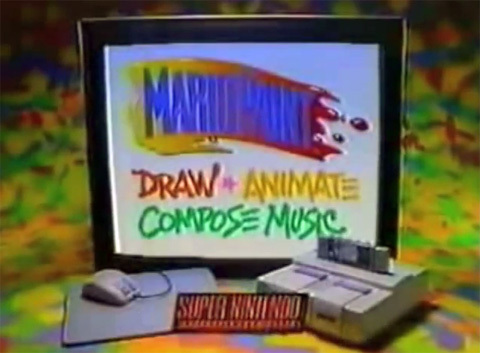 There are a couple different commercials for Mario Paint, but this one seems much more illusive. I googled the lyrics that I remembered from the commercial and never had luck with anything that popped up. I wonder if it only aired for a short time because of the kid singing “darn”?